It’s been a long time since people have had a reason to care about Mos Def’s music. While I have a soft spot for 2004’s The New Danger, I think we can all agree that his last two albums were below his usual standards, frustrating fans who loved him during his Rawkus glory years. Reportedly, Mos Def hated being on Geffen Records, which picked up his contract after it bought Rawkus, and he may have tanked those albums in order to get out of his deal. But that’s my theory. Mos Def has recently signed with Downtown Records, the home of Gnarls Barkley, Spank Rock and — in a joint venture with Atlantic and Vice — Justice. The tres cool label has immediately set about resuscitating Mos’ music career by placing him and Spank Rock on an official remix of Justice’s club hit “D.A.N.C.E.,” which you can download at RCRD LBL. According to a story on Billboard.com, Mos Def is reuniting with Kanye West, who produced the best tracks on The New Danger. If the album comes out next year, it will coincide nicely with Mos Def’s blossoming acting career. He currently has several films in production and one of them, Michael Gondry’s new flick Be Kind Rewind, is already penciled in for January 25. The buddy comedy, which co-stars Jack Black, is about two video store clerks who reshoot popcorn classics such as Back to the Future and Ghostbusters. 80s babies will love it. 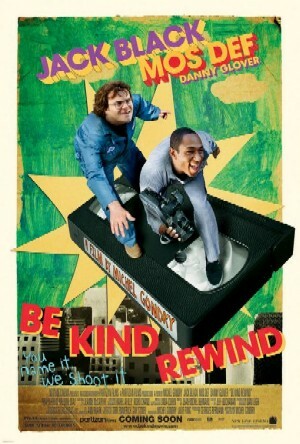 Since there’s not much to report on Mos Def’s new album, here’s the trailer for Be Kind Rewind.